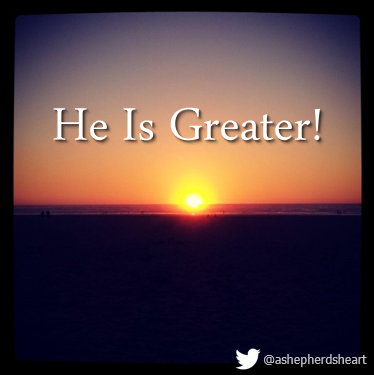 A Shepherd's Heart: Life Experience Reflection: He Is Greater! I've come to personally learn over the last 25 years that The Creator of the universe has proven time & time again that He is greater than & more capable than I am of handling & seeing me through any disappointment & discouragement. He's greater than what any dishonest or unloving person says or thinks about me. He's greater during the times that for whatever reason that I'm overlooked for things I could be a real asset or have skills, gifting & calling to do. He's greater than my own self doubt, self image & times of depression. He's greater than my many flaws & sins & so much more. He's greater than anything that I experience in life. He caries me through the good as well as the bad times as my strength, shield & refuge.